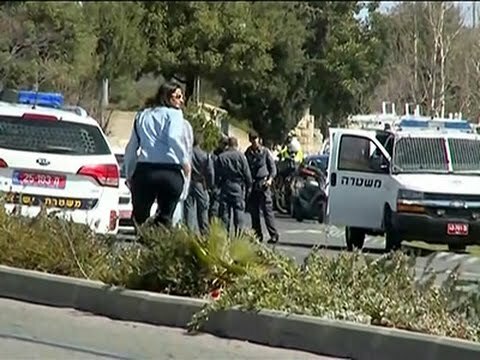 JERUSALEM (Ma’an) — A Palestinian ran his vehicle into a group of Israeli officers in the Sheikh Jarrah neighborhood of East Jerusalem on Friday, Israeli sources said. The driver was Muhammad Mahmoud Abd al-Razeq al-Salaymeh, 22, from the Ras al-Amud neighborhood in East Jerusalem. Israeli police spokesman Micky Rosenfeld told Ma’an the man was driving outside an Israeli border police station between East and West Jerusalem and struck five people, including four border police and one civilian pedestrian. After hitting the group, the man continued driving for around 100 meters, when he attempted to leave the vehicle wielding a knife. When exiting his car he was shot and arrested by border police and security guards, according to Rosenfeld. Israeli medical sources said that three of the individuals hit were injured moderately while another two were lightly injured. Al-Salaymeh is in critical condition. Rosenfeld added that security measures throughout Jerusalem were heightened in response to the incident. Following the attack, the Israeli police summoned the father and brothers of al-Salaymeh to the Russian compound for interrogation. Lawyer of the Addameer Prisoners Support and Human Rights Association, Muhammad Mahmoud, said that al-Salaymeh is currently in a hospital for treatment. Mahmoud added that a session will be held at the magistrate court on Saturday for extending the detention of al-Salaymeh. The incident is the first of its kind since a series of similar vehicular attacks in Jerusalem during the Fall of 2014, which killed several people. The attacks were labeled as “terrorist attacks” by Israeli authorities, and the attackers were shot dead at the scene in each case. The car attacks were part of ongoing tensions in East Jerusalem at the time, marking increasing instances of Palestinian youth throwing rocks and firebombs in the area, often targeting the light rail, buses, or cars. Israeli security forces heightened activity in East Jerusalem in response to the wave of violence, including the use of surveillance balloons, vamped up presence of police and border guards, the approval of a law enabling 20-year sentences for throwing stones, and punitive home demolitions. In the case of previous car attacks by Palestinians, Israeli Prime Minister Benjamin Netanyahu ordered the demolition of the homes of the attackers in an effort to deter future attacks. This policy of punitive demolitions received criticism due to the fact that demolitions punished individuals who hadn’t committed crimes, the family and often-times extended family of the attacker.